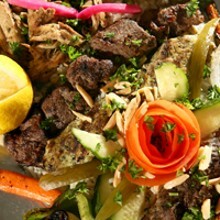 "White tablecloths, wine, fresh juices, Lebanese cuisine and pleasant company are all features of the Lebanese Grill. For an appetizer try hommus, falafel, grape leaves or wing dings. Then try one of our many salads  from tabbouli and fattoush to Greek, spinach and Caesar  these are an especially delicious, fresh way to start your meal. For entrées, we offer extensive listings of lamb, beef, poultry, seafood, and vegetarian or combination plates. You may have to make multiple visits to fully enjoy this outstanding Lebanese cuisine, now offered with a full selection of spirits and fresh juices. Don't forget to ask for dessert  baklava and others are always fresh."